Just as the increasing ubiquity and significance of digital media have provoked us to revisit the book as a technology, they have introduced concepts that, retroactively, we can productively apply to older media. Interface, a digital-born concept, is such an example. 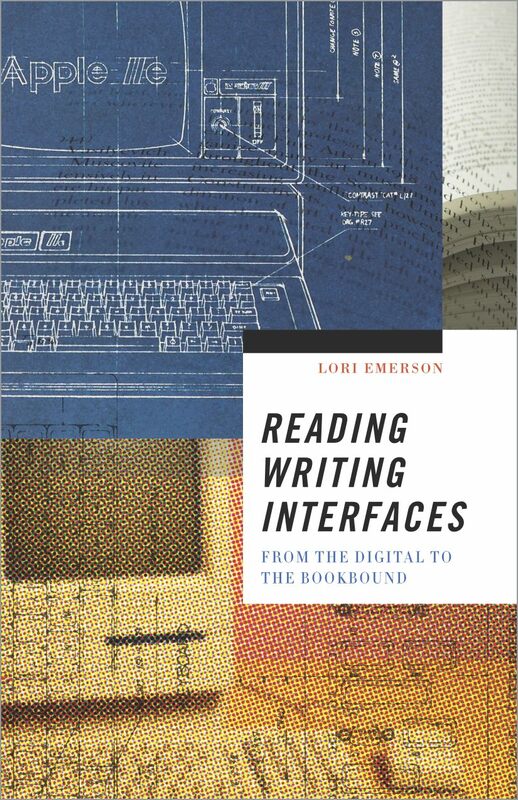 Reading Writing Interfaces: From the Bookbound to the Digital probes how interfaces have acted as a defining threshold between reader/writer and writing itself across several key techno-literary contexts. As I outline in the chapter summaries below, my book describes, largely through original archival research, ruptures in present and past media environments that expose how certain literary engagements with screen- and print-based technologies transform reading/writing practices. To borrow from Jussi Parikka’s What Is Meda Archaeology? (2012), my book “thinks” media archaeologically as its analyses undulate from present to past media environments. More specifically, I lay bare the way in which poets in particular – from the contemporary Jason Nelson and Judd Morrissey back to Emily Dickinson – work with and against interfaces across various media to undermine the assumed transparency of conventional reading and writing practices. My book, then, is a crucial contribution to the fields of media studies/digital humanities and poetry/poetics in its development of a media poetics which frames literary production as ineluctably involved in a critical engagement with the limits and possibilities of writing media. My book works back through media history, probing poetry’s response to crucial moments in the development of digital and analog interfaces. That is, the book chapters move from the present moment to the past, each also using a particular historical moment to understand the present: Reading Writing Interfaces begins with digital poetry’s challenge to the alleged invisibility of multitouch in the early 21st century, moves to poets’ engagement with the transition from the late 1960s’ emphasis on openness and creativity in computing to the 1980s’ ideology of the user-friendly Graphical User Interface, to poetic experiments with the strictures of the typewriter in the 1960s and 1970s, and finally to Emily Dickinson’s use of the fascicle as a way to challenge the coherence of the book in the mid to late 19th century. Thus, throughout, I demonstrate how a certain thread of experimental poetry has always been engaged with questioning the media by which it is made and through which it is consumed. At each point in this non-linear history, I describe how this lineage of poetry undermines the prevailing philosophies of particular media ecology and so reveals to us, in our present moment, the creative limits and possibilities built into our contemporary technologies. By the time I return once again to the present moment in the post-script via the foregoing four techno-literary ruptures, I have made visible a longstanding conflict between those who would deny us access to fundamental tools of creative production and those who work to undermine these foreclosures on creativity. In many ways, then, my book reveals the strong political engagement driving a tradition of experimental poetry and argues for poetry’s importance in the digital age. The underlying methodology of Reading Writing Interfaces is the burgeoning field of media archaeology. Media archaeology does not seek to reveal the present as an inevitable consequence of the past but instead looks to describe it as one possibility generated out of a heterogeneous past. Also at the heart of media archaeology is an on-going struggle to keep alive what Siegfried Zielinski calls “variantology” – the discovery of “individual variations” in the use or abuse of media, especially those variations that defy the ever-increasing trend toward “standardization and uniformity among the competing electronic and digital technologies.” Following Zielinski, I uncover a non-linear and non-teleological series of media phenomena – or ruptures – as a way to avoid reinstating a model of media history that tends toward narratives of progress and generally ignores neglected, failed, or dead media. That said, following on the debates in the field of digital humanities about the connection of theory and praxis (the so-called “more hack, less yack” debate) my book is more about doing than theorizing media archaeology; it considers these ruptures at the intersection of key writing technologies and responses by poets whose practice is at the limit of these technologies. Crucially, no books on or identified with media archaeology have engaged thoroughly with the literary and none have consistently engaged with poetry in particular; thus my book is also an innovation in the field in that it uses this methodology to read poetry by way of interface. One of the most recent and well-known unveilings of an “interface-free interface” came in 2006 when research scientist Jeff Han introduced a 36-inch wide computing screen which allows the user to perform almost any computer-driven operation through multi-touch sensing. Han describes this interface as “completely intuitive . . . there’s no instruction manual, the interface just sort of disappears.” However, the interface does not disappear but rather, through a sleight-of-hand, deceives the user into believing there is no interface at all. I use this anecdote to open the introduction to Reading Writing Interfaces, first, as a way to illustrate the current trend in interface design which emphasizes usability at the expense of providing access to the underlying workings of interfaces, which in turn defines the limits and possibilities of creative expression. And second, I use the anecdote to begin a theoretical and historical overview of the notion of interface, particularly as it has played out in the computing industry in the last forty years. The definition of ‘interface’ I settle on throughout my book is one I adopt from Alexander Galloway to mean a technology, whether book- or screen-based, that acts as a threshold between reader and writing that also subtly delimits both the reading and writing process. This nuanced and yet expansive definition makes way for an acknowledgement of the decisive back-and-forth play that occurs between human and machine and it also broadens our conventional notions of interface to include a range of writing interfaces such as the command-line, the typewriter, or even the fascicle. In light of Reading Writing Interfaces‘ dual attention to media studies and poetry/poetics, I close the introduction with discussions of these two fields as they influence this project. I situate the book within media archaeology, which I take as my methodology, and explain how its emphasis on a non-teleological unearthing of uses/abuses of media allows me to proceed through my media history in reverse chronological order as I uncover media ruptures from the present through to the past. Finally, I conclude the introduction by pairing media archaeology with the notion of ‘media poetics’ as a way to account for poets’ activist engagement with the creative limits and possibilities of media. The first chapter, titled “Indisinguishable From Magic: Invisible Interfaces and their Demystification,” thus begins with the present moment. Here I argue that contemporary writers such as Young-Hae Chang, Judd Morrissey, Jason Nelson, and Jörg Piringer advance a 21st century media poetics by producing digital poems which are deliberately difficult to navigate or whose interfaces are anything but user-friendly. For example, Morrissey and Nelson create interfaces that frustrate us because they seek to defamiliarize the interfaces we no longer notice; it is a literary strategy akin to Viktor Schklovksy’s early twentieth century invocation of ‘defamiliarization’ to describe the purpose of poetic language – except here it is deployed to force us to re-see interfaces of the present. I argue it is precisely against a troubling move toward invisibility in digital computing interfaces that Judd Morrissey has created texts such as “The Jew’s Daughter” – a work in which readers are invited to click on hyperlinks embedded in the narrative text, links which do not lead anywhere so much as they unpredictably change some portion of the text before our eyes. The result of our attempts to navigate such a frustrating interface, structured as it is by hyperlinks we believe ought to lead us somewhere, is that the interface of the Web come into view once again. Likewise working against the clean, supposedly transparent interface of the Web, in “game, game, game and again game” Jason Nelson creates a game-poem in which he self-consciously embraces a hand-drawn, hand-written aesthetic while deliberately undoing poetic and videogame conventions through a nonsensical point-system and mechanisms that ensure the player neither accumulates points nor “wins.” At the heart, then, of the most provocative digital poems lies a thoroughgoing engagement with difficulty or even failure. By hacking, breaking, or simply making access to interfaces trying, these writers work against the ways in which these interfaces are becoming increasingly invisible even while these same interfaces also increasingly define what and how we read/write. In this chapter I also pay particular attention to how writers such as Jörg Piringer are creating poetry “apps” which work against the grain of the multitouch interface that has been popularized by Apple’s iPad – a device that perfectly exemplifies the ways in which the interface-free interface places restrictions on creative expression in the name of an ideology, more than a philosophy, of the user-friendly. The second chapter, “From the Philosophy of the Open to the Ideology of the User-Friendly,” uncovers the shift from the late 1960s to the early 1980s that made way for those very interfaces I discuss in chapter one which are touted as utterly invisible. Based on original archival research I undertook of historically important computing magazines such as Byte, Computer, and Macworld as well as handbooks published by Apple Inc. and Xerox, I bring to light the philosophies driving debates in the tech industry about interface and the consequences of the move from the command-line interface in the early 1980s to the first mainstream windows-based interface introduced by Apple in the mid-1980s. I argue that the move from a philosophy of computing based on a belief in the importance of open and extensible hardware to the broad adoption of the supposedly user-friendly Graphical User Interface, or the use of a keyboard/screen/mouse in conjunction with windows, fundamentally changed the computing landscape and inaugurated an era in which users have little or no comprehension of the digital computer as a medium. Thus, media poetics prior to the release of the Apple Macintosh in 1984 mostly takes the form of experimentation with computers such as the Apple IIe that at the time were new to writers. Digital poetry from the early 1980s by bpNichol, Geof Huth, and Paul Zelevansky does not work to make the command-line or Apple IIe interface visible so much as it openly plays with and tentatively tests the parameters of the personal computer as a still-new writing technology. This kind of open experimentation almost entirely disappeared for a number of years as Apple Macintosh’s design innovations and their marketing made open computer architecture and the command-line interface obsolete and GUIs pervasive. In the third chapter, “Typewriter Concrete Poetry and Activist Media Poetics,” I delve into the era from the early 1960s to the mid-1970s in which poets, working heavily under the influence of Marshall McLuhan and before the widespread adoption of the personal computer, sought to create concrete poetry as a way to experiment with the limits and possibilities of the typewriter. These poems – particularly those by the Canadian writers bpNichol and Steve McCaffery and the English Benedictine monk Dom Sylvester Houédard – often deliberately court the media noise of the typewriter as a way to draw attention to the typewriter-as-interface. As such, when Andrew Lloyd writes in the 1972 collection Typewriter Poems that “a typewriter is a poem. A poem is not a typewriter,” he gestures to the ways in which poets enact a media-analysis of the typewriter via writing as they cleverly undo stereotypical assumptions about the typewriter itself: a poem written on a typewriter is not merely a series of words delivered via a mechanical writing device and, for that matter, neither is the typewriter merely a mechanical writing device. Instead, these poems express and enact a poetics of the remarkably varied material specificities of the typewriter as a particular kind of mechanical writing interface that necessarily inflects both how and what one writes. Further, since they are about their making as much as they are about their reading/viewing, if we read these concrete poems in relation to Marshall McLuhan’s unique pairing of literary studies with media studies – a pairing which is also his unique contribution to media archaeology avant la lettre – we can again reimagine formally experimental poetry and poetics as engaged with media studies and even with hacking reading/writing interfaces. Further, this chapter also draws on archival research to uncover not only the influence of McLuhan on concrete poetry but – for the first time – to delineate concrete poetry’s influence on those writings by McLuhan that are now foundational to media studies. In the fourth chapter, “The Fascicle as Process and Product,” I read digital poems into and out of Emily Dickinson’s use of the fascicle; I assert the fascicle is a writing interface that is both process and product from a past that is becoming ever more distant the more enmeshed in the digital we become and the more the book becomes a fetishized object. Otherwise put, her fascicles, as much as the later-twentieth century digital computers and the mid-twentieth century typewriters I discuss in chapters two and three, are now slowly but surely revealing themselves as a kind of interface that defines the nature of reading as much as writing. More, extending certain tenets of media archaeology I touch on above, I read the digital into and out of Dickinson’s fascicles as a way to enrich our understanding of her work. Such a reading is a self-conscious exploitation of the terminology and theoretical framing of the present moment which – given the ubiquity of terms that describe digital culture such as ‘interface,’ ‘network,’ ‘link,’ etc. or even of such now commonly understood terms such as ‘bookmark’ and ‘archive’ which previously were only used by the bookish or the literary scholar – is so steeped in the digital and which, often without our knowing, saturates our language and habits of thought. Finally, in chapter five, the postscript to Reading Writing Interfaces, “The Googlization of Literature,” I focus on the interface of the search engine, particularly Google’s, to describe one of conceptual writing’s unique contributions to contemporary poetry/poetics and media studies. Building on the 20th century’s computer-generated texts, conceptual writing gives us a poetics perfectly appropriate for our current cultural moment in that it implicitly acknowledges we are living not just in an era of the search engine algorithm but in an era of what Siva Vaidhyanathan calls “The Googlization of Everything.” When we search for data on the Web we are no longer “searching” – instead, we are “Googling.” But conceptual writers such as Bill Kennedy, Darren Wershler, and Tan Lin who experiment with/on Google are not simply pointing to its ubiquity – they are also implicitly questioning how it works, how it generates the results it does, and so how it sells ourselves back to us. Such writing is an acknowledgement of the materiality of language in the digital that goes deeper than a recognition of the material size, shape, sound, texture of letters and words that characterizes much of twentieth-century bookbound, experimental poetry practices. These writers take us beyond the 20th century avant garde’s interest in the verbal/vocal/visual aspect of materiality to urge us instead to attend to the materiality of 21st century digital language production. They ask, what happens when we appropriate the role of Google for our own purposes rather than Google’s? What happens when we wrest Google from itself and instead use it not only to find out things about us as a culture but to find out what Google is finding out about us? “The Googlization of Literature,” then, concludes Reading Writing Interfaces by providing an even more wide-ranging sense of poetry’s response to the interface-free. Although it is not a digital work, you should check out kevin mcpherson eckhoff’s EASY PEASY (Snare, 2011), which directly concerns the poetic poetential of failure and miscommunication. His first book RHAPSODOMANCY covers similar ground. Congratulations on the new book, Professor Emerson! Thanks for the comment and the kind words! I’m checking out your website now.